Three years after Star Wars stunned the world of movie-making, the first sequel arrived, and George Lucas shocked everyone again by announcing The Empire Strikes Back as "Episode V". 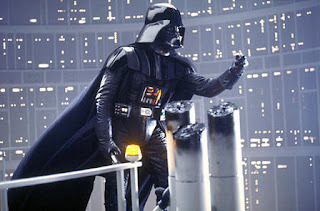 He revealed his vision for a nine-part epic, with the original Star Wars now re-named "Episode IV" and marking the beginning of just the middle trilogy. The Empire Strikes Back itself is interesting in several respects. Lucas left the screenwriting duties to Leigh Brackett and Lawrence Kasdan, and brought in Irvin Kershner as Director. Lucas focused his efforts on developing the special effects, further pushing the boundaries of visual achievement and again raising the benchmark of expectation. The Empire Strikes Back is also different in not offering any sort of climactic grand action finale. The film instead has the essential but unglamorous task of developing its characters and filling in concepts that were only outlined in the original movie. Thus a large part of Empire is occupied with Luke traveling to the planet Dagobah to meet the ancient Jedi Master Yoda and embark on his training as a Jedi. Through the slow and purposeful training scenes, both Luke and the viewer get to know a lot more about the Force and the ways of the Jedi. These scenes also serve as Luke's transition into adulthood and his understanding of the world and his role in it. Meanwhile, Princess Leia and Han Solo find time to develop a clunky romance based on horribly cheesy dialogue as the rebels are routed out of their hideout on the icy planet Hoth. Thankfully Leia and Han soon need to focus on more important matters as they fall into the clutches of Darth Vader in Cloud City, a mining planet run by Lando Calrissian, an old shifty acquaintance of Solo. Han ends up getting the worst of Calrissian's double-cross, while the closest thing that passes for a climax is a Luke and Darth Vader light saber duel that ends in a relative stalemate, notwithstanding Luke losing an arm, but not before a revelation that represents one of the more memorable and iconic moments in movie history. Mark Hamill as the more mature and confident Luke does well and carries the main weight of Empire, while Harrison Ford and Carrie Fisher need to contend with plastic lines and the worst of cliches as they fall in love based on...nothing much, really. 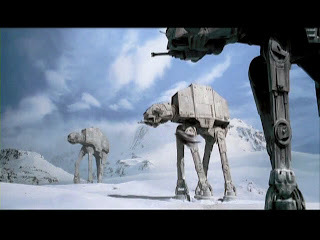 Visually, Lucas delivers the AT-AT Walkers as a stunning tank-as-massive-camel weapon for the Empire in the battle on Hoth, and then tops himself with the wire-trip trick that the rebels use to fell the lethal metal monsters. The AT-ATs quickly joined the long list of striking Star Wars symbols instantly recognizable beyond the movie world. The Empire Strikes Back does not deliver the thrills of some of the other entries in the Star Wars saga, and it very much feels like the middle of the story with no sharp edges at either end, but it does fulfill its mission in providing significant depth to the Star Wars galaxy and its inhabitants.